Who’s ready to rock with Twenty Over at the iconic Lamplighter Inn Tavern & Grille in downtown Palatine? Since 1999, Twenty Over has become one of the Northwest Suburbs favorite rock and country music cover bands, performing great songs from Kings of Leon, The Gin Blossoms, Third Eye Blind, Lit, Zac Brown Band, Luke Bryan, Eric Church, and more. They’ll make sure you have a great time! Lamplighter Inn is a family-owned, neighborhood pub with a friendly atmosphere that’s been attracting loyal customers for 33 years. Food & drink will be available for purchase. 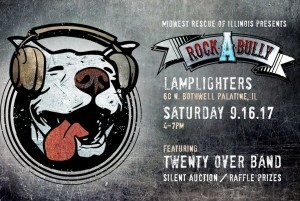 100% of the proceeds benefit Midwest Rescue of Illinois, Inc., a local, 501(c)(3) not-for-profit volunteer and foster based dog rescue. Our volunteers find forever homes for pit bulls, advocate for the breed, and serve as a resource for pet owners. So dust off your dancing shoes and get ready to rock, all while supporting a great cause! Tickets will be sold at the door for $20 but early bird tickets are available through Eventbrite for only $15! What a deal! Please join us for a fantastic time. And be sure to bring your friends and family! As much as we love children and dogs, this is a 21+ and people only event. And if you can’t attend but still want to support our rescue pups, you can donate through PayPal; donate@midwestrescue.org. 7th Annual Barking for Brews!